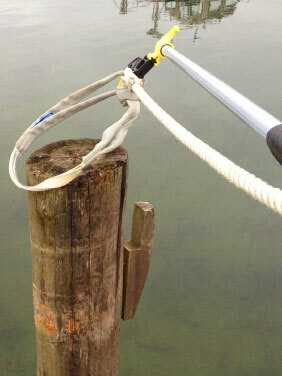 HandyDock for all type of mooring! 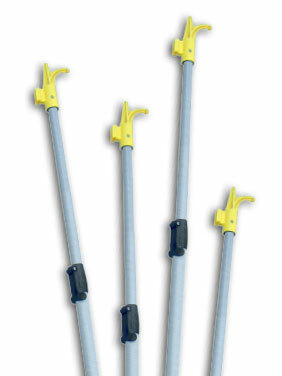 HandyDock for Bollards, cleats, Piles, Mountain Double etc! HandyDock is easy to release even when it is loaded. Moored at buoys, rings, piles or similar. Mooring hook for all kind of docking..
All our poles are made of fiberglass and are lightweight, incredibly strong and completely insensitive to salt water. They are also more pleasant use than the conventional of aluminum. 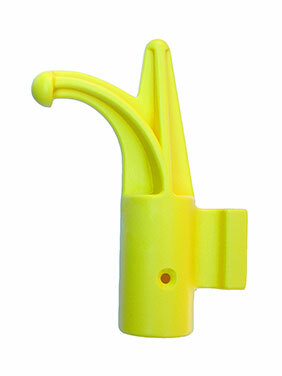 With this accessory you can easily dock at bollards, cleats, piles or similar. If you already have a bundle poles. Is there a limit to how small the mooring ring can be? When you want to moor in a ring such as a buoy or a bridge, it is VERY IMPORTANT! that the ring inside diameter not less than 45 mm. 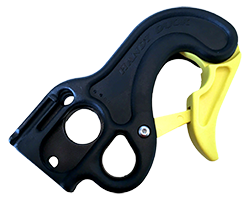 If the diameter is less than 45 mm, the hook does not move freely when the mooring line are subjected to forces and the risk is then that the hook locking mechanism felbelastas and can be damaged. How much weight can HandyDuck handle? HandyDock can handle up to 1.5T direct load. How big boats can HandyDock handle? If you do not find the answer to your question, we will be happy to your question via email.